A huge array of charts I am following are signaling caution. 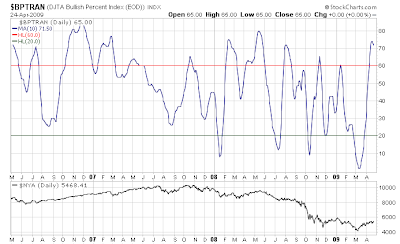 Let's take a look at various Bullish Percent charts, High-Low charts, and McClellan Oscillator charts, starting with a review of the theory behind each. 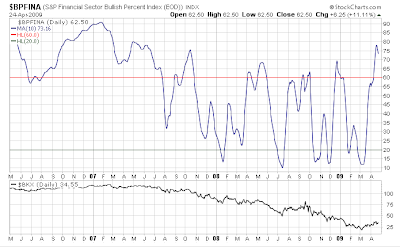 The Bullish Percent Index (BPI) is a popular market breadth indicator that is calculated by dividing the number of stocks in a given group (an exchange, an industry, etc.) that are currently trading with Point and Figure buy signals, by the total number of stocks in that group. 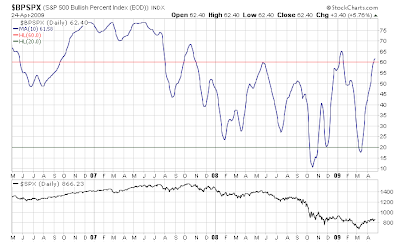 Bullish Percent levels that are above 70% are considered overbought, whereas levels below 30% are considered oversold. 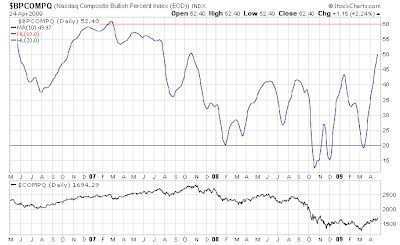 Strong buy signals occur when the Bullish Percent Index falls below 30% and then reverses up by at least 6%. 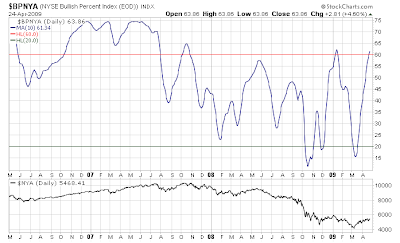 Conversely, promising sell signals occur when it goes above 70%, and then reverses down by at least 6%. 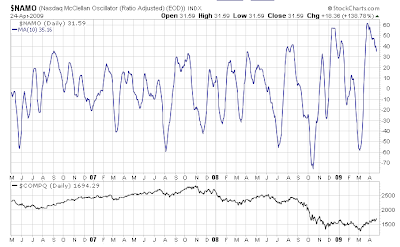 Developed by Sherman and Marian McClellan, the McClellan Oscillator is a breadth indicator derived from each day's net advances, the number of advancing issues less the number of declining issues. Subtracting the 39-day exponential moving average from the 19-day exponential moving average of net advances forms the oscillator. Buy and sell signals are generated as well as overbought and oversold readings. 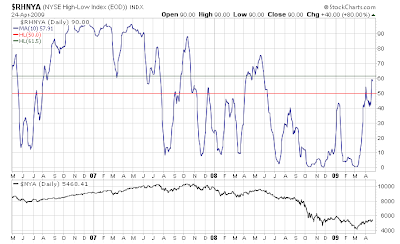 Usually, readings above +100 are considered overbought and below -100 oversold. Overbought and oversold readings may vary among indices and historical precedent. 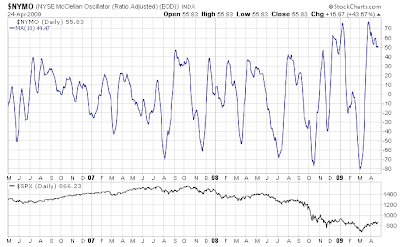 Buy signals are generated when the oscillator advances from oversold levels to positive territory. 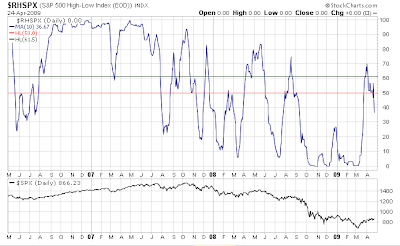 Sell signals are generated on declines from overbought to negative territory. Traders may also look for positive or negative divergences to time their trades. A series of rising troughs would denote strength, while a series of declining peaks weakness. The Record High Percent Index is a market breadth indicator created by dividing the number of 52-week highs for a given market by the sum of the number of new highs and the number of new lows. The values range between 0.0 and 1.0. A value of 0.0 means that there were no new highs on that day. A value of 1.0 means that there were no new lows on that day. 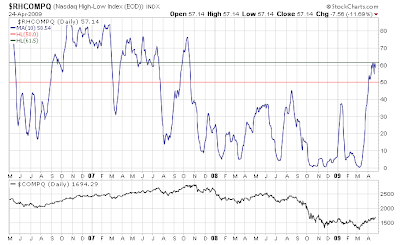 A value of 0.5 means that the number of new highs and new lows were equal. Please remember these indicators are not a precise timing device. Nor do they indicate magnitude of a move. They do however indicate direction, and in this case, a potential change in direction. The key point to note is these and many other similar indicators are flashing warning signs that this rally is getting very long in the tooth. With that in mind, bulls may wish to consider reviewing their risk reward setups and stop loss positions. Bears who have not been blown out of the water may have an opportunity at hand.